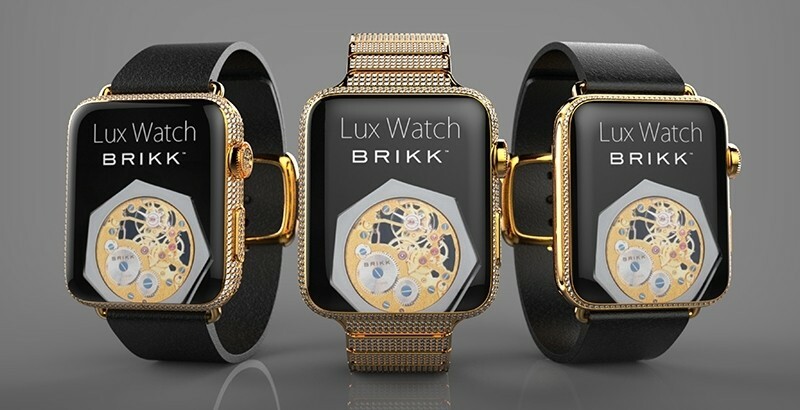 Apple’s first wearable will start at a modest price of $349 but if you’re the type that wouldn’t be caught dead with such a cheap accessory, you may want to turn to luxury retailer Brikk to meet those lavish needs. The high-end electronics modifier is accepting pre-orders for multiple version of the Apple Watch covering a range of budgets. The baseline Lux Watch Standard consists of a single row of diamonds set around either a 38mm or 42mm face. It’ll be offered in 24K yellow gold, 18K pink gold or 950 platinum with prices starting at $7,495. If money is no object, the Lux Watch Omni will be the wearable you’ll want. Also offered in both face sizes, this premium watch is set with multiple rows of diamonds around the face, buttons and strap clasp as well as a full strap set with diamonds. The diamonds on the Omni will total 12.30 carats on the 42mm version and 11.30 carats on the smaller 38mm face. Brikk only uses diamonds with a color grade of DE and a clarity rating of VVS. As before, buyers will be able to choose between 24K yellow gold, 18K pink gold or 950 platinum. A 42mm Omi in 24K gold will command $74,995 while the smaller 38mm variant will fetch $69,995. Need an iPhone to match that Apple Watch? How about this iPhone 6 Plus 128GB for $56,995?